From both historic and archaeological perspectives migration forms a fundamental component in constituting European societies. Archaeological, as well as more recently, also genetic research shows that phases of population stasis were followed by phases of often rapid population change. In fact, since about 7000 years ago a considerable proportion of the European population stock has been of Near Eastern ancestry. These people arrived from the western Eurasian centre of origin for agriculture, the so-called Fertile Crescent, exactly the same region from which also today people strive to reach Europe. 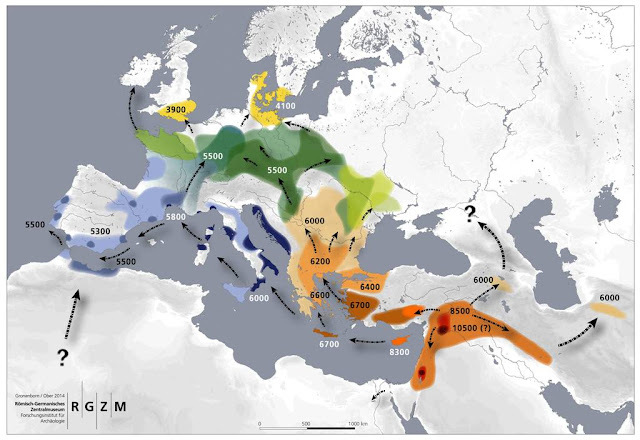 But migration to Europe goes back much deeper into the past as the early archaic humans arrived between a million to 800.000 years ago from Africa, via the Near East. Lastly this means that we are all of African descent. Possibly somewhat strife-ridden might have been the arrival of the anatomically modern humans about 40.000 years ago, again from Africa. These people were our direct ancestors. They came into contact with Neanderthal populations and appear to have pushed those back to the western marginal zones of the Eurasian land mass. However, occasionally these populations seem to have mixed so that about 1,5 to 2 % of the modern European DNA pool is of Neanderthal origin (Prüfer et al. 2014). Those immigrant anatomically modern humans constituted the European population stock for the next 33.000 years, well until the Ice Age or Glacial was over. While there are indications for occasional small-scale migrations during the early post-Glacial millennia, the next great population change occurs only with the expansion of farming to Europe, 7000 years ago. Now people with an entirely new technology and economy arrive in Southern, Temperate and Western Europe. Largely, two routes have been taken, one - land-based - went from Anatolia via Greece, the Balkans, and Hungary lastly to Central Europe (Gronenborn 1999; Szécsényi-Nagy et al. 2015; Horejs et al. 2015). Interestingly enough, those are exactly the same routes as they are currently being taken by refugees from Syria and other parts of western Asia. Also, the regions of origin are more or less the same: the Fertile Crescent around the river valleys of the Euphrates and Tigris, and the surrounding landscapes. One reason for those past migrations might have been climate fluctuations as rising populations would have faced subsistence difficulties during periods of adverse climatic conditions (Weninger et al. 2014). Apart from the way into Europe by land, across the Balkans, another route was taken by seaborne settlers along the Mediterranean coasts. Those farmers eventually made it to the Iberian Peninsula and into North-West Africa where they settled and introduced farming and animal husbandry (Paschou et al. 2014). Spread of agriculture in Western Eurasia. Farming as well as their cereals and husbandry originate from the Fertile Crescent (orange). In many regions of continental Europe, particularly in the West, did the immigrant population come into contact with indigenous hunter-gatherers. These contact situations have been examined by archaeology for many decades: farmers and indigenous hunter-gatherers seem to have benefited form each other and may have lived, side by side, in the same villages, each with their respective economies and specialisations (Gronenborn 2007). In marginal landscapes and in the coastal regions, hunting and gathering persisted, sometimes for millennia, aside farming communities settling on more fertile soils. Every recent study on genome-wide ancient DNA from hunter-gatherer and farming individuals revealed information on physical differences between those populations much beyond the classic physical anthropology studies. Apparently the indigenous hunter-gatherer population was rather dark-skinned, yet with light eyes, while the population migrating from Anatolia was lighter skinned and dark-eyed (Mathieson et al. 2015). These physical differences, but maybe much more the fundamental differences in languages, rites, and customs may be the reason that, in many regions, for millennia the admixture between immigrant farming and indigenous hunting and gathering populations was rather negligible. Nevertheless those societies knew of each other, communicated and cooperated. During this period of early farming – the Neolithic – an accumulation and assimilation process sets in, which is largely finalized around 4200 years ago. Now a new population sweeps across large parts of Europe with its origins in the steppe regions of present-day south-eastern Russia and the Ukraine. With the onset of the Bronze Age European societies are genetically largely constituted in their present form, migration rates are much lower in the following millennia (Brandt et al. 2013). Summing up, the current picture is that the present European population is composed of three large components, each attributable to extensive migration events in the deep past: One component dates back to the Ice Age and arrived in Europe about 40.000 years ago, the next component came with the onset of farming about 7000 years ago and the last arrived from the steppes around 5000 years ago (Haak et al. 2015). Eventually all these populations mixed, integrated and cooperated, lastly not only formed present-day Europe but also contributed to the Early Modern population mix in the Americas, in Southern Africa, and as far away as Australia and New Zeeland. D. Gronenborn, A variation on a basic theme: the transition to farming in southern central Europe. Journal of World Prehistory 13/2, 1999, 123-210. D. Gronenborn, Beyond the Models: ‘Neolithization’ in Central Europe. In: A. Whittle / V. Cummings (Hrsg. ), Going Over: the Mesolithic-Neolithic Transition in North-West Europe. Proceedings of the British Academy 144 (London 2007) 73-98. Mathieson, Iain; Lazaridis, Iosif; Rohland, Nadin; Mallick, Swapan; Patterson, Nick; Roodenberg, Songül Alpaslan et al. (2015): Genome-wide patterns of selection in 230 ancient Eurasians. Nature 528, 2015, pp. 499-503. - DOI: 10.1038/nature16152. Paschou, Peristera; Drineas, Petros; Yannaki, Evangelia; Razou, Anna; Kanaki, Katerina; Tsetsos, Fotis et al. (2014): Maritime route of colonization of Europe. Proceedings of the National Academy of Sciences of the United States of America 111 (25), 2014, pp. 9211–9216. - DOI: 10.1073/pnas.1320811111. Szécsényi-Nagy, Anna; Brandt, Guido; Haak, Wolfgang; Keerl, Victoria; Jakucs, János; Möller-Rieker, Sabine et al. (2015): Tracing the genetic origin of Europe's first farmers reveals insights into their social organization. Proceedings. Biological sciences / The Royal Society 282 (1805), 2015. - DOI: 10.1098/rspb.2015.0339. Prof. Dr. Detlef Gronenborn is an archaeologist at the RGZM (Römisch-Germanisches Zentralmuseum), teaching at Mainz university. His research currently focuses on the Neolithic in Temperate Europe and on Iron Age to pre-Modern West and Southern Africa. Palmyra war 2015 wegen der Zerstörungen durch Daesh in den Schlagzeilen - weil hier Geschichte zerstört wurde, die wir als Teil unserer eigenen Vergangenheit verstehen. 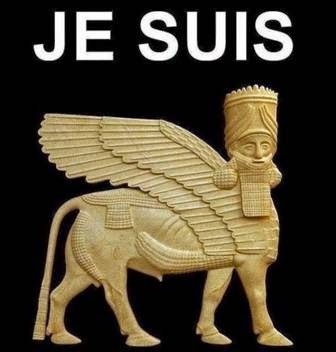 Aber Palmyra wurde 2015 nicht zum ersten Mal zerstört. Das letzte Mal waren allerdings Archäologen diejenigen, die ein Zerstörungswerk vollbracht und Menschen ihrer Geschichte beraubt haben. Bis 1929 lag das arabische Dorf Tadmor im Bereich der antiken Ruinen. Rund um den nun gesprengten Tempel des Baal befand sich im Schutz des alten, zu einer Befestigung ausgebauten Tempelbezirks ein Dorf mit mehreren hundert Einwohnern. Europäische Reisende beschreiben es sehr herablassend als ärmlich. Um die Ruinen freizustellen und Ausgrabungen zu ermöglichen, wurden die Bewohner von der französischen Mandatsmacht, die die Kontrolle in Syrien nach dem Ersten Weltkrieg übernommen hat, kurzerhand auf einen Platz nordöstlich der Ruinenstadt zwangsumgesiedelt. Die Moschee, die in den Ruinen des Baal-Tempels errichtet worden war, wurde abgetragen. Eine Dokumentation der vermutlich bis ins 12./13. Jahrhundert zurück reichenden Relikte der arabischen Vergangenheit erfolgte nicht. Bei der Krise im Nahost darf nicht übersehen werden, dass gerade auch der Westen einen nicht unerheblichen Teil zur heutigen Instabilität beigetragen hat - und das nicht erst seit dem amerikanischen Angriff auf den Irak nach 9/11, der die Entstehung des Daesh erst möglich gemacht hat. Schon vor dem ersten Weltkrieg hatten die Europäer in vielen Regionen des osmanischen Reiches, in Marokko, Libyen, Ägypten, Syrien, am Bosporus und auf dem Balkan eigene koloniale Interessen. Mit dem auch heute nicht wirklich überwundenen selbst-zentrierten Weltbild ging eine Ausbeutung und Entwürdigung der dortigen Menschen einher, an der auch die Archäologie ihren Anteil hat. Die Vergangenheit des Nahen Ostens wurde und wird als Teil der eigenen europäischen Geschichte in Anspruch genommen. Bis zu einem gewissen Grade mit Recht, liegen doch dort ganz wichtige Innovationszentren der Geschichte, von der bäuerlichen Sesshaftigkeit über die ersten Städte bis zur frühen Bürokratie, Schriftlichkeit und Staatlichkeit - die aber allesamt nicht nur Teil der westlichen Geschichte sind. Die Probleme des heutigen Kulturgutschutzes, Zerstörung durch bilderstürmende Terroristen, Plünderungen für einen Markt im Westen, wie auch ein alltägliches Desinteresse an den Ruinen hat nicht zuletzt mit der westlichen Vereinnahmung der Geschichte im Vorderen Orient zu tun. Wir dürfen uns also nicht wundern, wenn archäologische Funde vor Ort nicht als Relikte der eigenen Vergangenheit und Identität wahrgenommen werden. Da ich selbst nicht in der Region arbeite, weiß ich nicht, inwiefern die Erinnerung an die "Kolonialzeit" heute noch eine unmittelbare Rolle spielt. Heute finden Ausgrabungen nach Möglichkeit immer in Koorperation mit regionalen Institutionen statt und Funde dürfen schon lange nicht mehr ausgeführt werden. Initiativen, wie die des DAI, das im Norden Jordaniens für Kinder, sowohl der Einheimischen als auch der Flüchtlingsfamilien aus Syrien Workshops anbietet, um die eigene Geschichte kennen zu lernen, sind daher ein ganz wichtiger Beitrag zum Kulturgutschutz. 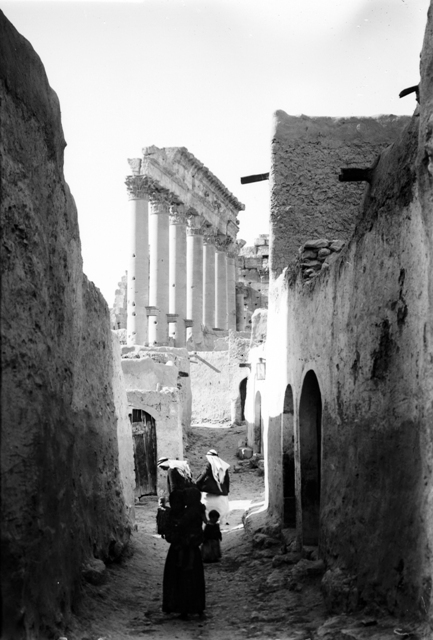 Umsiedlungen ortsansässiger Bevölkerung, wie in Palmyra, mit dem Ziel antike Denkmäler freizustellen und archäologische Untersuchungen zu ermöglichen, waren in der Vergangenheit nicht selten. Dies betrifft beispielsweise auch Petra in Jordanien, wo man die nomadische Bevölkerung, die die antike Stätte noch vor wenigen Jahrzehnten genutzt hat, in kleinen Häusern angesiedelt hat. Diese Umsiedlungen zugunsten der Archäologie sind aber kein Phänomen des Vorderen Orients allein. Auch die antiken Heiligtümer von Delphi und Olympia oder auch die Kaiserforen inmitten von Rom waren einst dicht besiedelt. Diese Umsiedlungen im Namen der Archäologie sind ein Kapitel der Forschungsgeschichte, das dringend einer Aufarbeitung bedarf. 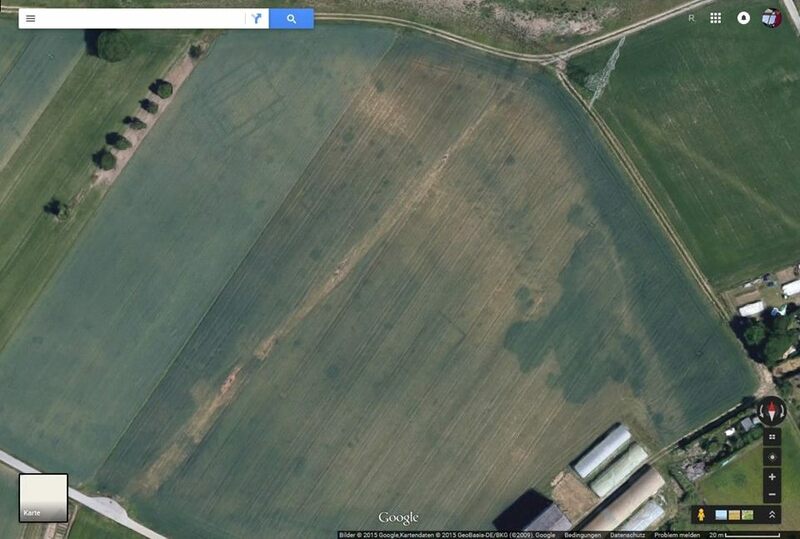 In England steht das Portable Antiquities Scheme am Scheideweg. Nach Mittelkürzungen fallen viele der FLOs weg und für die Zahlungen - die der 'Kundschaft' von PAS immer so wichtig waren - ist kein Geld mehr da. Die Spendenbereitschaft der Nutznießer ist gleich null. Organisatorisch ist PAS nun der Abteilung Öffentlichkeitsarbeit des British Museum angegliedert, was prinzipiell zu begrüßen ist, denn genau diese war in der Vergangenheit eher fatal: Es gibt keine Anleitung für die Sondengänger für die verantwortungsvolle Praxis, in Form einer Darstellung, die einmal erklären würde, was ein Fundkontext ist und weshalb eine Dokumentation so wichtig ist. Immer wieder kam es zu Fällen, wo unter den Augen der FLOs archäologische Fundstellen vernichtet wurden, darunter ein Fall, in dem möglicherweise ein frühmittelalterliches Gräberfeld nicht erkannt wurde, stattdessen aber zahlreiche 'Hortfunde' auf einem Feld geborgen wurden. Allerdings wird gerade an der Arbeit mit den Sondlern nun massiv gekürzt. Mit Stand Anfang 2015, als die Neuorganisation von PAS nur in Anfängen zu erkennen war (bis heute scheint es keine klare Kommunikation der aktuellen Situation zu geben), fasst ein Artikel im neuesten Band der Archäologischen Informationen die Rolle von PAS zusammen. Als Überblick seien hier einmal die Beiträge zum Krieg in Syrien und Irak, die auf Archaeologik seit 2012 erschienen sind, aufgelistet. die Meldungen zum Bürgerkrieg in Syrien und Irak sind mit dem Label Syrien - Bürgerkrieg versehen. Gleich zwei Wracks namens San José gehen derzeit durch die Presse. Beide werden kommerziell ausgebeutet: Einmal in der Karibik in kolumbianischen Gewässern und einmal im Pazifik vor Panama. Beide wären sie eine wichtige Quelle zur frühen Globalisierung. Sie haben eine wissenschaftliche Untersuchung und eine vollständige Präsentation ihrer Funde verdient. In einer Seeschlacht vor Cartagena wurde am 8. Mai 1708 die spanische Galeone San José von britischen Kriegsschiffen versenkt. Nachdem das Schiff in Brand geraten war, explodierte seine Pulverkammer. 578 Menschen kamen dabei ums Leben. Seeschlacht vor Cartagena 8. Mai 1708: Die San José wird von britischen Kriegsschiffen versenkt. Da das Schiff mit 344 Tonnen Gold- und Silbermünzen sowie 116 Kisten mit Smaragden aus Peru beladen war, interessieren sich schon lange Schatzjäger dafür. Nachdem ein Gericht bereits vor Jahren Ansprüche einer Schatzbergefirma verneint hatte, die die Lage des Wracks bereits in den 1980er Jahren grob eingegrenzt hatte, hat vor wenigen Wochen die kolumbianische Regierung die Entdeckung des Schiffs bekannt gegeben. Nun erheben die Schatzjägerfirma, wie auch die spanische Regierung Anspruch auf die Ladung. Die kolumbianische Regierung, die erst vor kurzem die kommerzielle Ausbeutung der Wracks vor seinen Küsten mehr oder weniger frei gegeben hat, will 50% der archäologischen Funde der nun beauftragten Bergefirma überlassen. Arqueólogo colombiano pide dejar el galeón San José bajo el mar y no llamarlo “tesoro”. Patrimonio subacuático.net (18.12.2015). 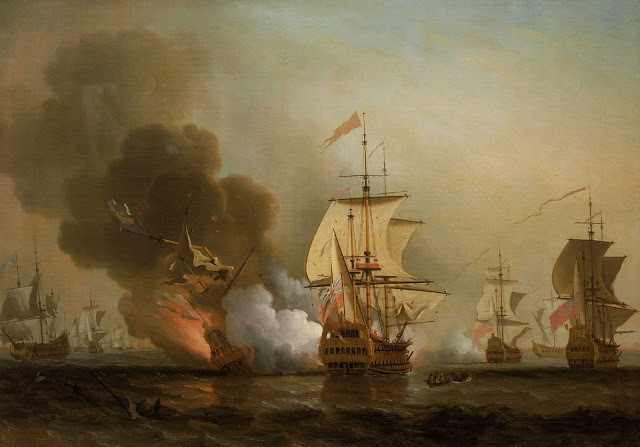 - http://patrimoniosubacuatico.net/2015/12/18/arqueologo-colombiano-pide-dejar-el-galeon-san-jose-bajo-el-mar-y-no-llamarlo-tesoro/ "Die San José ist kein Schatz": Juan Guillermo Martín zum Wrack der San José. Die San José in den Pazifikgewässern vor Panama wurde bereits 2002 entdeckt. Diese San José ist bereits 1631 gesunken. Sie hatte angeblich 700 t Gold und Silber im Schätzwert von 50 Millionen $ geladen. Entgegen internationaler Vereinbarungen, die Panama im Gegensatz zu Kolumbien unterzeichnet hat, sollen nun 65% der Funde an eine private Bergefirma gehen. Die UNESCO hat bereits im Frühjahr Protest eingelegt. Die laufenden Bergungen werden nicht regelmäßig fachmännisch begleitet. Ein Expertengutachten zu den inzwischen vorliegenden Funden stellte fest, dass sich darunter auch jüngere Objekte befinden, so dass sich abzeichnet, dass es mangels Dokumentatione nicht einmal möglich sein wird, die genaue Fracht des Schiffes festzustellen. In beiden Fällen besteht zu befürchten, dass keine wissenschaftliche Dokumentation der Wracks erfolgt und die Ladung ohne zureichende Untersuchung verkauft wird. Die beiden Wracks sind Zeugnisse des großen Kapitalflusses aus dem spanischen Kolonialreich nach Europa. Aus dem ehemaligen Inka-Reich wurden Unmengen Gold und Silber nach Panama transportiert. Die San José aus Panama gehört in diesen Teil des Handels. Von Panama aus wurde die Fracht auf dem Landweg über den Isthmus von Panama nach Portobelo gebracht und von dort nach Spanien verschifft. Die in kolumbianischen Gewässern versenkte San José repräsentiert die Atlantikpassage. Was dies alles war, wie die Ladung sich genau zusammensetzt, in welcher Form das Gold und Silber transportiert wurde, wie homogen die Ladungen waren, wären wichtige Informationen, um den Transatlantikhandel der Zeit und die Ausplünderung der Kolonien besser kennen zu lernen. Eine genaue Dokumentation der Wracks wäre auch Voraussetzung, um mehr über den Alltag der Seeleute zu erfahren. Die Geschichte des 17. Jahrhunderts in Panama ist ein wesentlicher Teil der modernen Geschichte der Globalisierung. Bisher wurde sie immer aus spanischem Blickwinkel betrachtet, aus dem das 17. Jahrhundert als Krisenzeit erscheint. Immer mehr verlor Spanien die Kontrolle über sein Kolonialreich, nicht zuletzt durch steigendes Interesse anderer europäischer Mächte. Der Wrackfund der San José von 1708 dokumentiert das einträglich. Die Fragen, die mit diesem Abschnitt der Globalisierung zusammen hängen, werden ab 2016 in einem neuen EU-Projekt untersucht, das an der Universität Sevilla in Spanien angesiedelt ist ("An ARTery of EMPIRE. Conquest, Commerce, Crisis, Culture and the Panamanian Junction (1513-1671)". Hier fließen auch Erfahrungen und Vorarbeiten des Tübinger Panama-Projektes ein, das 2003-2009 mit überwiegender Finanzierung durch die DFG durchgeführt wurde (vergl. Archaeologik). Eine der Hypothesen des Projektes ist es, dass die Krise des spanischen Kolonialreiches vor Ort eher eine Phase des regionalen Aufblühens war, das der kolonialen Gesellschaft neue Möglichkeiten eröffnet hat. Archäologisch gibt es da verschiedene Zugriffe über die Analyse der Baukonjunktur in der Stadt, aber auch über eine Analyse der Importfunde aus China, die damals zunahmen. Die vergleichende Analyse von Schiffsladungen - aus schriftlichen Quellen, aber vor allem auch aus archäologischem Kontext mit den Möglichkeiten der archäometrischen Herkunftsbestimmung der Ladung - ist ein wichtiger Baustein für das Verständnis der wirtschaftlichen Veränderungen im Lauf der Zeit. Es íst falsch, solche Wracks als Schätze zu sehen, sie sind in erster Linie historische Dokumente, von denen wir alle über unsere Welt lernen können. Der Mangel an historischem Bewusstsein ist ein Problem unserer Zeit, in der Entscheidungen immer kurzsichtiger werden und rechte Parolen wieder Fuss fassen können. Kürzungen im Geschichtsunterricht sind fatal. Archäologie, die schon lange in den Lehrplänen nur noch rudimentär vorkommt (und auch für die Welt kein nennenswertes Thema ist), wäre neben der jüngeren Geschichte besonders wichtig, denn sie hat das Potential, nicht nur mit ihren langen Zeiträume die Dimension der Zeit zu vermitteln, sondern auch deutlich zu machen, wie veränderlich 'Kultur' ist - und wie historisches Wissen entsteht. 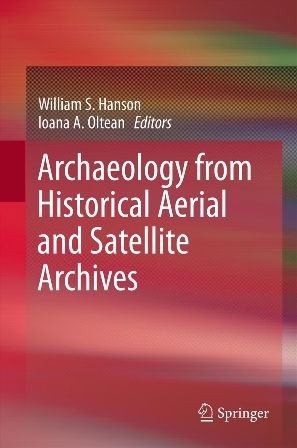 Zum "Wissenschaftsblog des Jahres 2015" ist auch Archaeologik nominiert. Wer seine Stimme abgegeben möchte, kann das hier bis zum 1.1.2016 tun. Ein italienisches Blog fordert freie und kostenlose Reproduktionserlaubnis für historische Quellen und Kulturgut - auch für die Archäologie. In Deutschland hat das Reiss-Engelhorn-Museums in Mannheim eine Abmahnwelle gegen Nutzer von CC-Bildern gestartet, die in Wikipedia präsentiert wurden. Es handelt sich um Bilder in öffentlichem Besitz, was die Frage aufwirft, inwiefern ein Museum de facto den öffentlichen Zugang zu diesen Werken unterbinden darf. Ein Verbot der freien Nutzung von dokumentarischen Fotos von Kulturgut und ein konservatorisch nicht begründetes Fotografierverbot verhindert einen freien Zugang der Gesellschaft zu Kulturgut und ihre Auseinandersetzung mit ihm. In Mannheim geht es um Fotos von Gemälden, also um 2D-Reproduktionen von 2D-Werken. Eine solche Reproduktion gemeinfreier Werke begründet kein Urheberrecht. Bei archäologischen Funden ist die Situation noch einmal schwieriger. Auch hier ist das Urheberrecht längst erloschen, doch stellt sich die Frage, ob in der Dokumentationsfotographie die 2D-Inszenierung eines 3D-Objektes eine urheberrechtsrelevante Schöpfungshöhe begründet? Wie sieht es mit 3D-Modellen von 3D-Objekten aus (vergl. Das Urheberrecht der Eiszeitmenschen. Archaeologik 8.1.2013)? Und wie ist die Situation, wenn der archäologische Fund nur in einer modernen Kopie vorliegt? Inwieweit können hier andere Leistungsschutzrechte im Spiel sein? Antiken gefällig? Bitte nicht!! - Eine Handreichung des DGUF-Arbeitskreises "Kulturgutschutz"
"Wer sein Altöl in einen Fluss kippt, darf sich breiter Empörung, einer Anzeige und ernster juristischer Konsequenzen sicher sein. Bei Raubgrabungen und illegaler Sondengängerei ist dies oft noch anders: Die Wahrnehmung und Reaktion vieler Bürger und Politiker ist viel eher: Es ist doch nur "altes Gelumpe", wem schadet das schöne Hobby des Sammelns schon? Worin genau besteht also der von Raubgräbern angerichtete Schaden? Warum ist die Kenntnis der richtigen Fundstelle für Archäologen so wichtig? Und was kann man als Bürger tun, wenn man mit Raubgrabungen und dem illegalen Handel mit archäologischen Funden konfrontiert ist?" (New York, Heidelberg, Dordrecht, London: Springer 2013). Luftbildarchäologie ist in hohem Maße vom richtigen Befliegungszeitpunkt abhängig. Oft ist es nur ein Zeitfenster von wenigen Stunden, in dem die richtigen Bedingungen herrschen, um ein Bodendenkmal sichtbar zu machen. In Deutschland war man zudem lange Zeit der Meinung, für die Zwecke der Archäologie seien nur Schrägaufnahmen brauchbar. Die für Zwecke der Geoinformatik wie auch für die militärische Aufklärung regelmäßig angefertigten Senkrecht-Aufnahmen, deren Flugtermin sich auch nicht an optimalen Beobachtungsbedingungen für Bewuchsmerkmale orientierte, schienen für die Luftbildarchäologie hingegen eher uninteressant. Man sah deshalb nur geringe Chance in vorhandenen Luftbildarchiven beispielsweise der Landesvermessungsämter archäologisch interessante Aufnahmen zu finden. Luftbildarchäologie bestand deshalb weitgehend aus aktiven, mehr oder weniger gezielten, jedenfalls aber archäologisch initiierten Befliegungen. Inzwischen stehen viele Luftbilder online, meist eben die lange wenig geschätzten Senkrecht-Aufnahmen. Dabei zeigt es sich, dass selbst bei Google interessante archäologische Befunde zu entdecken sind. Hier auf Archaeologik wurden schon mehrfach entsprechende Beispiele gezeigt (vergl. Archaeologik), vor allem aber war von jener Entdeckung die Rede, bei der es gelungen ist, von Tübingen aus erstmals sog. "raised fields" in Mittelamerika zu identifizieren (http://archaeologik.blogspot.de/2015/02/publikation-zu-den-hochbeeten-von.html). Welches Potential in existierenden Luftbildarchiven steckt, zeigt der Band von Hanson & Oltean in zahlreichen Beispielen. Sie decken viele Regionen Europas ab: England, Frankreich, Belgien, Portugal, Spanien, Italien, die ehemalige Tschechoslowakei, Ungarn, Rumänien und Rußland sowie darüber hinaus Armenien, Jordanien, Kambodscha und Uruguay. Beispiele aus Deutschland fehlen. Die Beispiele betreffen damit sehr unterschiedliche Naturräume mit ganz unterschiedlichen Potentialen für die archäologische Luftbildforschung. Die meisten Luftbilder, die in den Beiträgen herangezogen werden, sind in militärischem Kontext entstanden. In Flandern und in Nordfrankreich sind Luftbilder aus dem Ersten Weltkrieg von Bedeutung. Der Beitrag von Stichelbaut u.a. (S. 69ff.) 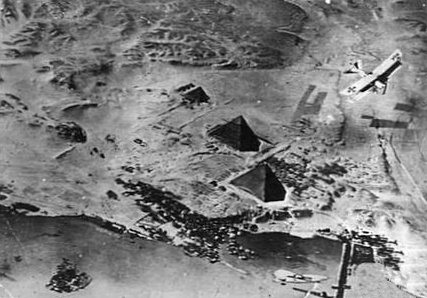 zu Flandern zeigt das Potential der Bilder nicht nur für eine Rekonstruktion der Kriegslandschaft des Ersten Weltkriegs, sondern auch für die Lokalisierung archäologischer Fundstellen in dieser massiv durch die Schlachten umgewühlten Region. Eine Verifizierung der Beobachtungen ist heute kaum mehr möglich und so bleibt die Interpretation einiger Kreisstrukturen als bronzezeitliche Grabhügel unklar. Es könnte sich hier auch um militärische Anlagen handeln. Sicherer ist die Ansprache im Falle der etwas komplexeren Strukturen mittelalterlicher Niederungsburgen. Viele von ihnen sind nur aus den Luftbildern des ersten Weltkriegs bekannt (fig. 5.5.). Der Beitrag von Robert Bewley und David Kennedy (S. 221ff.) zeigt das Potential historischer Luftbilder aus Jordanien und Palästina. Ihre Existenz war schon lange bekannt - viele der Bilder stehen auch online etwa unter https://www.flickr.com/photos/apaame/collections/72157627159146427/ oder dem Bayerischen Hauptstaatsarchiv - doch hat erst die aktuelle Krise im Nahen Osten zu einer verstärkten Auseinandersetzung mit ihnen geführt. Für die Verwendung historischer Luftbilder ist vor allem die Ermittlung einschlägiger Bildbestände und -archive nicht immer einfach. Aufgrund ihres militärischen Hintergrundes befinden sie sich häufig nicht in dem betreffenden Land, sondern zerstreut in ausländischen (Militär-)Archiven der kriegsführenden Parteien oder ehemaligen Kolonialmächte. Viele Luftbilder sind schon früher an Archäologische Institute gelangt. Einzelne sind schon früher publiziert worden. Mehrere Beiträge ziehen CORONA-Satellitenbilder aus den 1960er und 70er Jahren heran (vergl. Archaeologik 8.12.2011).. I.A. Oltean und W.S. Hanson (S. 315ff.) nutzen sie im letzten Beitrag des Bandes, um den römischen Limes an der Unteren Donau in Rumänien zu rekonstruieren. R. Palmer (S. 279ff.) nutzt Corona-Bilder von 1970, um in Armenien einen ersten Eindruck der Siedlungslandschaft zu gewinnen. Ihren besonderen Wert entfalten die Corona-Aufnahmen beispielsweise in Kambodsche (Beitra. D. Evans/ E. Moylan, S. 291ff. ), wo die Landschaft durch die Agrarpolitik der Roten Khmer grundsätzlich verändert wurde. Der Band zeigt sehr schön das Potential historischer Luft- und Satellitenbilder. Mehrfach werden auch online-Datenbanken angegeben, bei denen oft allerdings eine freie Nachnutzung nicht gegeben scheint. Man vermisst eine Zusammenfassung der verschiedenen Erfahrungen, aus denen man ja auch einige Handlungsempfehlungen ableiten kann, wie künftig mit entsprechenden Luftbildern umgegangen werden sollte und wie man ihre Recherchierbarkeit verbessert. Ein Denkmal an einem Golfplatz in Sterling/ Virginia erinnert an eine Schlacht im amerikanischen Bürgerkrieg. Donald Trump, republikanischer Bewerber um die US-Präsidentschaftskandidatur hat sie anbringen lassen. Das Problem: Diese Schlacht ist frei erfunden. Bereits vor wenigen Wochen war Ben Carson in die Medien geraten, da er alle wissenschaftlichen Erkenntnisse über die Pyramiden in Ägypten zur Seite gewischt hatte und eine 'biblische' Interpretation vertreten hat (dabei übersehend, dass die betreffende Bibelstelle keineswegs die Pyramiden nennt). Die Auseindersetzung mit Geschichte soll dazu dienen, etwas aus ihr zu lernen, oder zumindest über Zusammenhänge nachzudenken. Deshalb ist die Einstellung von Politikern gegenüber der Geschichte nicht gleichgültig und die historischen Wissenschaften sollten dies genau beobachten und ggf. auch thematisieren. Denn sonst laufen wir Gefahr tatsächlich für dubiose politische Ideen missbraucht zu werden. Das glückliche Ausbleiben neuerlicher publikumwsirksamer Zerstörungen durch Daesh (IS) ruft wieder die zahlreichen Kriegszerstörungen in Erinnerung, die ein Kennzeichen dieses alles verachtenden Bürgerkrieges ist. 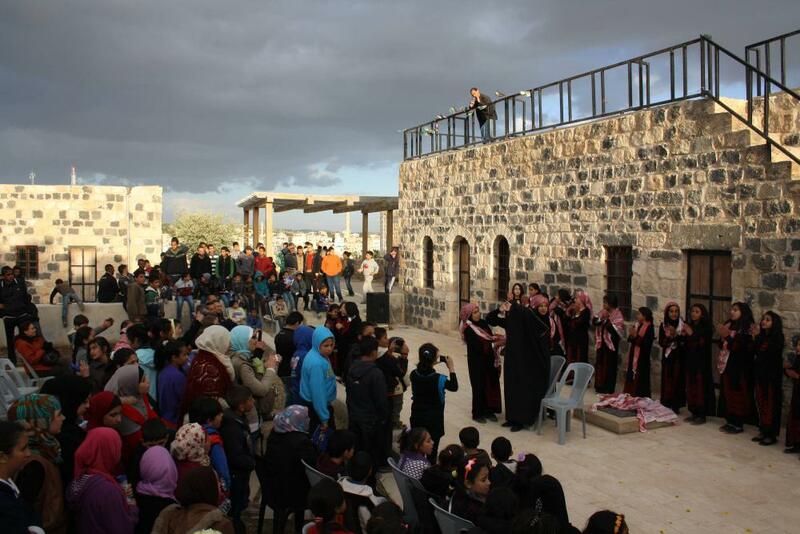 Heritage for Peace legt den dritten Bericht über die internationalen Reaktionen zum Kulturgutschutz in Syrien vor. Er deckt den Zeitraum von Oktober 2014 bis Oktober 2015 ab. Der Bericht listet die internationalen Aktivitäten auf. So ist beispielsweise auch Archaeologik unter International Actions - Damage Assessment: Reports and Databases gelistet. Die "links to the media sources" werden dabei hervorgehoben. In ihren Schlussfolgerungen stellen die beiden Autorinnen einen bemerkenswerten Anstieg von Kooperationsprojekten der wichtigsten nationalen und internationalen Gruppen und Organisationen fest. Vor allem im Bereich der Bereitstellung von Datenbanken und Inventaren sehen sie einen großen Fortschritt. Vielen geht es darum, Schäden festzuhalten und den illegalen Handel zu bekämpfen. Dazu ist eine Kooperation mit Partner vor Ort notwendig, da nur so eine realistische Einschätzung der Lage möglich ist. Solche Kooperationen verhndern auch Doppelarbeit oder konkurrierende Initiativen. Der Bericht soll genau bei dieser Koordination von Maßnahmen helfen. Verwiesen sei auch auf die Seite Patrimoine syrien pendant la guerre civile der französischen Wikipedia, die ebenfalls eine Liste der Zerstörungen bietet. 2.11.2015 russische Bomben auf die Zitadelle bei Palmyra? 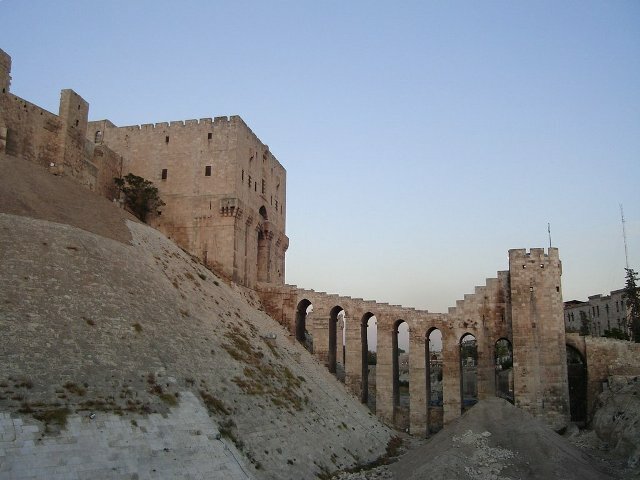 In Aleppo ist es schon länger Teil der Stadtkämpfe, dass Tunnel gegraben und gesprengt werden, um Gebäude zu zerstören. Am 7.11. beschädigte eine Tunnelsprengung den Zugang zur Zitadelle von Aleppo. Das Oriental Institute der Tschechischen Akademie der Wissenschaften hat einen ersten Entwurf der zerstörten islamischen Denkmale aus Mosul vorgelegt. http://dgam.gov.sy/index.php?d=314&id=1852 - Fotos zeigen einige Schäden und Schmierereien, die sich ohne Kenntnis des Platzes aus Zeiten vor dem Krieg schwer beurteilen lassen. Bei der UNESCO setzt sich Russland demonstrativ für eine Schadensaufnahme in Syrien, Irak und Afghanistan ein, um festzustellen, welchen Schaden die Terroristen angerichtet haben. Der russische Außenminister reist persönlich zur UNESCO-Konferenz in Paris.Staatsnahe russische Medien berichten vom Vormarsch syrischer Bodentruppen auf Aleppo mit der Schlagzeile "Fighting in Ruins for the Future" und zeigt damit schon Mal die propagandistiche Rolle, die einer Rückeroberung Palmyras mit russischer Hilfe politisch zukommen könnte. Auf einem Markt in der östlichen Türkei sind Funde aufgetaucht, bei denen der Verdacht besteht, dass sie aus dem Musem in Palmyra stammen. Bislang sind allerdings kaum Fakten bekannt - noch ist nicht einmal klar, ob die Funde Originale oder Fälschungen sind. G. Wessel: Die Beute das Abu Sajjaf. Die ZEIT, 26. 11. 2015, S. 60 (print). Die syrische Altertumsbehörde ist aufgrund der von der Assad-Regierung erstaunlich unabhängigen Arbeit von deren Direktor Maamoun Abdulkarim international weiterhin gut in die verschiedensten Veranstaltungen und Maßnahmen eingebunden.